I've been waiting for this sequel to Shiver for a long time. I wasn't disappointed. This werewolf tale is, heartbreaking. Linger is told in 4 points of view. The first 4 chapters were all from someone different and I wasn't sure if I would like that, but I LOVED IT! I loved the new character Cole and loved that Isabel made a bigger appearance. There is more to Cole than meets the eye, and I ended up REALLY liking him. Sam is human now. He is afraid of shifting back into a wolf and is trying to believe in his cure. Linger is his book. This is his story. I really hated Grace's parents. Can I say that? They haven't been parent's her whole life, and NOW they decide they can tell her what to do? They just don't get it. 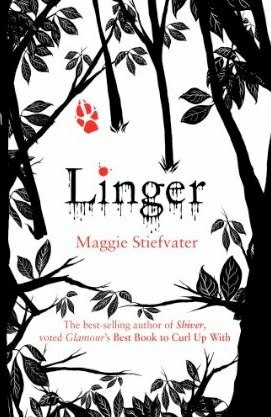 Linger is full of love, longing, hope, anxiety, and just so much more. The ending is heart breaking, and I just can't wait for the 3rd book Forever! It is going to be an epic fight for love! "To Grace, these were the things that mattered: my hands on her cheeks, my lips on her mouth. The fleeting touches that meant I loved her." I so can't wait to read this. Thanks for your review. Man oh man I need to read this series. I've been DYING to read this book, I couldn't wait to get my hands on a copy, but I just can't bring myself to pick it up and read it just yet. Maybe because everyone's reading it and reviewing it and I feel like I need to be contrary? I don't know what it is, but it's not happening. I'm sure I'll read it and love it eventually.. I loved Isabel and I'm glad to hear she's in this book more! Great review! so excited for this! glad you had a lot of good things to say about it. it's in my possession but i lent out my copy of Shiver which i haven't finished yet.